Robert Murphy rolled into Charlotte in 1976 and it is no exageration to say that radio in the Carolinas was never the same. Initially reluctant to leave WOKY in Milwaukee for the smaller Charlotte market, Murphy soon learned what many people in the broadcasting industry already knew - That when Stan and Sis Kaplan (owners of Big WAYS and WROQ ) wanted something, they generally got it. And what they wanted was a radio talent big enough to fill the shoes of departing morning DJ Jay Thomas, and to finally topple the stranglehold that rival station WBT held on the ratings in morning drive time. With Murphy they got both! A fortuitous pairing of Murphy with WAYS production director Larry Sprinkle turned out to be a spectacular combination. While Murphy wrote the comedic scripts that filled the show, Sprinkle brought them to life with his seemingly endless well of character voices, from a psychic named The Great Dildoni, to dead on knock offs of Howard Cosell, Elvis, David Brinkley, and Mr. Rogers, the last of which bringing Murphy the first of many threatened lawsuits, when the real Mr. Rogers sued, relenting when the name was changed to Mr. Codgers. Other bits from the prolific mind of Murphy included Battlestar Gastonia, Another World in Waxhaw, Parker Myers from Myers Park, Pick your News, and Mutha Nature, whose question "How do you give shoulders?" is still being talked about. Also adding to the show were newsmen Frank Coley and Mike Bumgardner, while legendary Charlotte Observer sports reporter Bob Quincy, brought not only the sports report, but a finely tuned sense of humor to the show as well. After the show was over, Murphy made quite a name for himself (and a few friends) by delivering Bojangle's Bisquits to local businesses. Whatever he did, it appears it was working. 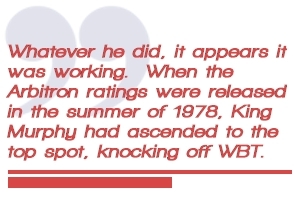 When the Arbitron ratings were released in the summer of 1978, King Murphy had ascended to the top spot, knocking off WBT. After that, Murphy stayed at or near the top of the ratings, but as The Charlotte Observer noted, "..numbers aside, Murphy was the jock that people talked about." But wait! The story doesn't end there. Just as it seemed like Murphy would settle down, do his show, and make nice with WBT, he didn't. First, after both Big WAYS and WBT hosted very similar promotions at the same time and the same day, and the Big WAYS event outdrew WBT's in attendance about five to one, Murphy didn't brag about it on the air the next morning, he simply told listeners that to obtain the results, call this phone number, and then gave out the WBT request line. Well, they didn't like it. And they liked it even less when shortly after that, Murphy debuted ADA Weather, mocking WBT's expensive weather service, Accu Weather. While that service relied on extensive computer prognostication, Murf's relied on an elderly woman with a large arthritic knot in her arm that she said told her what the weather was going to be. Chalk up another lawsuit for Murphy, and even though he later gave in, it was not until after ADA Weather correctly called an upcoming severe snowstorm, while AccuWeather botched the forecast. Noted the Charlotte News, "Murphy loves to tug at WBT's tail, and WBT..almost always plays right into his hands with an outburst of stiff-necked indignation." And then came the Pass The Loot Club, as Murphy had the audacity to mock the Charlotte based PTL (Praise The Lord) Club, run by Jim and Tammy Faye Bakker, with Larry Sprinkle this time playing the Reverend Bill Taker, whose sole goal in life was seemingly to separate people from their money. All hell ensued. Lawsuits were threatened, lives were threatened, it was front page of every local newspaper. But Stan Kaplan refused to back down in the face of threatened lawsuits and the Pass The Loot Club remained on the air until Murphy himself decided it was time. Shortly thereafter, a serious sexual scandal brought down Jim Bakker, and improprieties in the conduct of business within the PTL Club sent him off to prison. But other things were happening in Robert Murphy's life at this time. Radio stations from New York, Los Angeles, Washington DC, Chicago and other cities were plying him with offers to leave Big WAYS behind. He turned down one offer after another while Stan tried to keep him happy with toys, such as cars and boats, not too mention a healthy salary. (Kal Rudman's Friday Morning Quarterback proclaimed Murphy to be "..the highest paid medium market jock in the country). But after six years in Charlotte, Murphy, who had always expressed a passion for the city of Chicago, decided it was time to go. After some wrangling over contract issues, Murphy accepted an offer from NBC owned WKQX in Chicago, and saying goodbye to his friends at Big WAYS and WROQ, and to his radio audience, Murphy did his last show on December 31, 1982.